Photo via Pixabay, X-ray diffraction image courtesy of The Ohio State University. An international team of Researchers has set a new record for developing ice crystals that have a near-perfect cubic arrangement of water molecules. It is a form of ice that might exist in the coldest high-altitude clouds, but is very hard to make on Earth. Barbara Wyslouzil, Project Leader and Professor of Chemical and Biomolecular Engineering at The Ohio State University, said that the ability to study and make cubic ice in the laboratory could enhance computer models of how clouds interact with the atmosphere and sunlight—both key to understanding climate change. It could also improve the understanding of water, one of the most vital molecules for life on our planet. Seen under a microscope, normal water ice—from frozen ponds, to snow, to the ice people make at home—is made up of crystals with hexagonal symmetry, Wyslouzil said. However, the crystals can take a cubic form with only a small change in how the water molecules are arranged in ice. 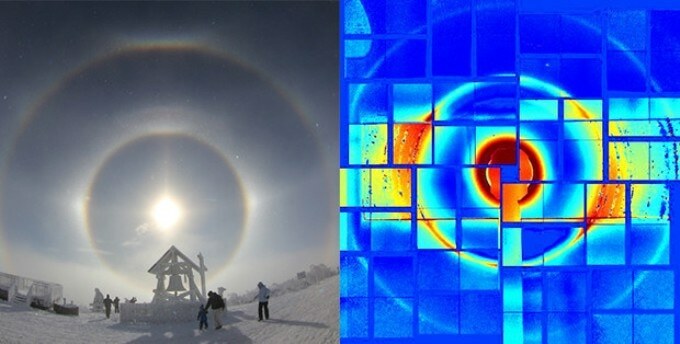 Until now, Scientists have used the presence of cold cubic ice clouds high above the surface of the earth to explain interesting halos seen around the sun, and the presence of triangular ice crystals in the atmosphere. For decades, Researchers have struggled to create cubic ice in the laboratory, but since the cubic form is unstable, the closest anyone has come is to create hybrid crystals that are around 70% cubic and 30% hexagonal. In a paper published in the Journal of Physical Chemistry Letters Wyslouzil, Graduate Research Associate Andrew Amaya and their collaborators describe how they were able to make frozen water droplets that were nearly 80% cubic. While 80 percent might not sound ‘near perfect,’ most researchers no longer believe that 100 percent pure cubic ice is attainable in the lab or in nature. So the question is, how cubic can we make it with current technology? Previous experiments and computer simulations observed ice that is about 75 percent cubic, but we’ve exceeded that. The Researchers drew water vapor and nitrogen through nozzles at supersonic speeds in order to make the highly cubic ice. When the gas expanded, it cooled and formed droplets a hundred thousand times smaller compared to the average raindrop. These droplets were very much supercooled, meaning that they were liquid well below the normal freezing temperature of 32 °F (0 °C). In fact, these droplets remained liquid until about -55 °F (around -48 °C) and then froze in about one millionth of a second. Researchers carried out X-ray diffraction experiments at the Linac Coherent Light Source (LCLS) at the SLAC National Accelerator Laboratory in Menlo Park, CA to measure the cubicity of the ice formed in the nozzle. There, they hit the water droplets with the high-intensity X-ray laser from LCLS and noted the diffraction pattern on an X-ray camera. The Researchers also saw concentric rings at wavelengths and intensities that pointed out that the crystals were around 80% cubic. The very low temperatures and quick freezing were essential to forming cubic ice. Since liquid water drops in high-altitude clouds are typically supercooled, there is a good chance for cubic ice to form there. Exactly why it was possible to create crystals with around 80% cubicity is currently unknown and exactly how water freezes on the molecular level is also unknown. When water freezes slowly, we can think of ice as being built from water molecules the way you build a brick wall, one brick on top of the other. But freezing in high-altitude clouds happens too fast for that to be the case—instead, freezing might be thought as starting from a disordered pile of bricks that hastily rearranges itself to form a brick wall, possibly containing defects or having an unusual arrangement. This kind of crystal-making process is so fast and complex that we need sophisticated equipment just to begin to see what is happening. Our research is motivated by the idea that in the future we can develop experiments that will let us see crystals as they form.